This week I got hold of a copy of the environmental direct action film Just Do It. The documentary follows the lives of a group of people working for climate justice, even when that brings them into conflict with the law. It conveys the passion, creativity and sheer audacity of the Climate Camp movement. It also charts a more subtle shift which is directly relevant to the current global protests. While opposition to the dominant economic model has always been a feature of Climate Camp, the film shows this critique increasingly coming to the fore. This is most visually reflected in the changing messages of the banners that adorn the different protests. The earliest simply reads ‘Welcome to Climate Camp’, followed by ‘Nature Doesn’t Do Bailouts’, then ‘Capitalism is Crisis’. At the Copenhagen climate talks in December 2009, campaigners from across the world joined behind the banner ‘Reclaim Power’ – in protest against not just climate change but also the unjust political and economic systems that allow it to perpetuate. Later scenes feature protests which aren’t explicitly linked to climate change, but which are in opposition to neoliberalism. The Capitalism is Crisis banner at the #Occupy protest outside St Paul's. Photo by Charles Hutchins under a CC Licence. The extent to which Climate Camp informed the #Occupy protests is most obviously apparent in the use of public camping as a protest tactic, but also in the practice of consensus decision-making and the opposition to any economic model which hurts people and the planet. 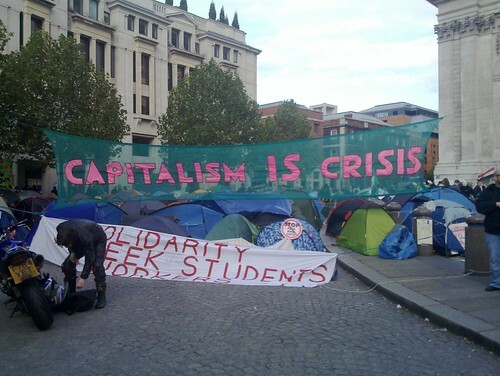 The ‘Capitalism is Crisis’ banner even adorns the camp at St Paul’s. Echoing the message of the Copenhagen mobilization, the ‘Occupy’ movement has placed an emphasis on the need for real democracy, particularly highlighting the manner in which the richest 1 per cent prevents supposedly democratic systems from functioning democratically. One statement endorsed by a significant number of occupations calls the world’s financial institutions ‘our global Mubarak’. In many ways, this is a reiteration of the message of the campaigns that preceded the Climate Camp. For example, one of the most iconic images of the summit protests of the so called anti-globalization movement is the banner hung in Seattle in 1999 with arrows pointing away from one another indicating the opposing directions of the WTO and democracy. Yet the drawing of such links is far older. As far back as the 1790s, Tom Paine’s great work The Rights of Man called not only for the vote, but for a decent standard of living, too. Similarly, we can see in the writings of prominent Chartists, more radical Suffragettes, Ghana’s independence leader Kwame Nkrumah, and the Freedom Charter of the anti-apartheid movement, that many in the most celebrated historical movements for democracy have seen the struggle for political and economic rights as one and the same fight. Just Do It captures a year in the life of a small part of a global movement against illegitimate power. The latest face of the global movement continues to highlight environmental problems, but as just one of many ways that the 99 per cent are disadvantaged by the super-rich. Despite the presence of the ‘Capitalism is Crisis’ banner at St Paul’s, the question of whether this means that #Occupy is anti-capitalist or not is hotly contested. The debate even extends to the pages of the Occupied Times of London – the newspaper produced by activists at St Paul’s and Finsbury Square. Yet whatever the semantics, most would be able to agree with the problem as elucidated by one contributor: ‘out-of-control corporations hiding money in tax havens, lobbying corrupt politicians frantically for greater deregulation’. Many times in the past few weeks I have been asked, ‘but what do you propose as an alternative to what we have?’ The answer I give is the same that has been given by movements through history. The answer is democracy. Just Do It is available here. Tim Gee is the author of a new history of social movements: Counterpower: Making Change Happen, New Internationalist Publications, 2011.